In Office 365, archive mailboxes provide users with additional mailbox storage space. After a user's archive mailbox is enabled, up to 100 GB of additional storage is available. When the 100 GB storage quota is reached, organizations had to contact Microsoft to request additional storage space for an archive mailbox. That's no longer the case. 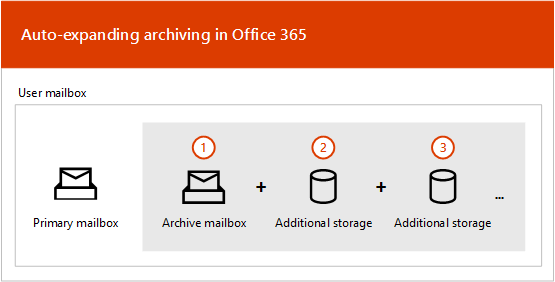 The new unlimited archiving feature in Office 365 (called auto-expanding archiving) provides an unlimited amount of storage in archive mailboxes. Now, when the storage quota in the archive mailbox is reached, Office 365 automatically increases the size of the archive, which means that users won't run out of mailbox storage space and administrators won't have to request additional storage for archive mailboxes. For step-by-step instructions for turning on auto-expanding archiving, see Enable unlimited archiving in Office 365. As previously explained, additional mailbox storage space is created when a user's archive mailbox is enabled. When auto-expanding archiving is enabled, Office 365 periodically checks the size of the archive mailbox. When an archive mailbox gets close to its storage limit, Office 365 automatically creates additional storage space for the archive. If the user runs out of this additional storage space, Office 365 adds more storage space to the user's archive. This process happens automatically, which means administrators don't have to request additional archive storage or manage auto-expanding archiving. Here's a quick overview of the process. Archiving is enabled for a user mailbox or a shared mailbox. An archive mailbox with 100 GB of storage space is created, and the warning quota for the archive mailbox is set to 90 GB. An administrator enables auto-expanding archiving for the mailbox. 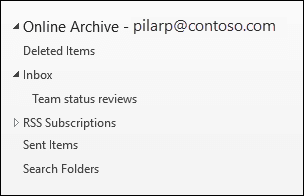 Then, when the archive mailbox (including the Recoverable Items folder) reaches 90 GB, it's converted to an auto-expanding archive, and Office 365 adds storage space to the archive. Note that it can take up to 30 days for the additional storage space to be provisioned. Office 365 automatically adds more storage space to the archive when necessary. If a mailbox is placed on hold or assigned to an Office 365 retention policy, the storage quota for the archive maibox is increased to 110 GB when auto-expanding archiving is enabled. Similarly, the archive warning quota is increased to 100 GB. What gets moved to the additional archive storage space? yyyy is the year the messages in the folder were received. mmm dd, yyyy h_m is the date and time that the subfolder was created by Office 365, in UTC format, based on the user's time zone and regional settings in Outlook. The following screen shots show a folder list before and after messages are moved in an auto-expanded archive. Outlook 2013 users can only access items that were originally stored in their archive mailbox. They won't be able to access items that are moved to additional archive storage. Here are some things to consider when using Outlook or Outlook on the web to access messages stored in an auto-expanded archive. You can access any folder in your archive mailbox, including ones that were moved to the auto-expanded storage area. You can search for items that were moved to an additional storage area only by searching the folder itself. This means you have to select the archive folder in the folder list to select the Current Folder option as the search scope. Similarly, if a folder in an auto-expanded storage area contains subfolders, you have to search each subfolder separately. 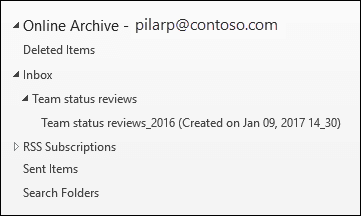 Item counts in Outlook and Read/Unread counts (in Outlook and Outlook on the web ) in an auto-expanded archive might not be accurate. You can delete items in a subfolder that points to an auto-expanded storage area, but the folder itself can't be deleted. You can't use the Recover Deleted Items feature to recover an item that was deleted from an auto-expanded storage area. This section explains the functionality between auto-expanding archiving and other Office 365 compliance and data governance features. eDiscovery - When you use an Office 365 eDiscovery tool, such as Content Search or In-Place eDiscovery, the additional storage areas in an auto-expanded archive are also searched. Retention - When you put a mailbox on hold by using tools such as Litigation Hold in Exchange Online or eDiscovery case holds and retention policies in the security and compliance center, content located in an auto-expanded archive is also placed on hold. Messaging records management (MRM) - If you use MRM deletion policies in Exchange Online to permanently delete expired mailbox items, expired items located in the auto-expanded archive will also be deleted. Import service - You can use the Office 365 Import service to import PST files to a user's auto-expanded archive. You can import up to 100 GB of data from PST files to the user's archive mailbox. For more technical details about auto-expanding archiving, see Office 365: Auto-Expanding Archives FAQ.